Last year, my son came home from kindergarten with a “Good Citizen” award. It was a cute little acknowledgement for doing something nice for someone else that entitled him to a gift certificate at a neighborhood hamburger place. He could not have been prouder walking in to redeem his reward and get his congratulations. It struck me as such a sweet way to make kids feel special and feel seen, and I had a thought: What if we could help do something like that, but for readers? We do a lot of work with schools—sending more and more authors out every year for incredible events, booktalking in classrooms, offering curated local bookfairs, partnering on large district-wide festivals and events—but maybe we can do a little more to build pride in individual readers who need some acknowledgement? I sent out exploratory emails to some librarian friends at the end of last year for feedback and then worked with Tomoko Bason, our art director, to get some eye-catching cards designed. 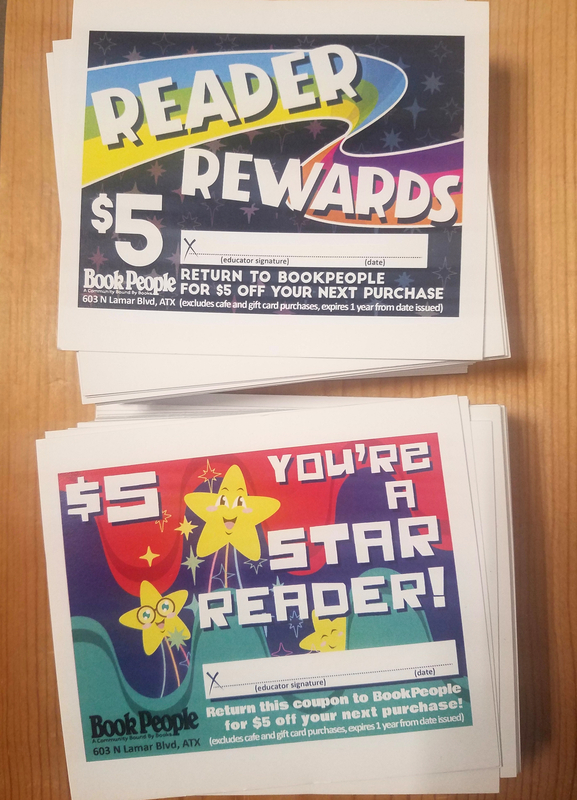 We went with two designs, one for younger kids who might be more excited by the idea of being called a Star Reader, and one for older kids who might prefer a less “cutesy” approach. For the kids who come in to redeem their cards, we’re keeping colored stars on-hand that they can write their first names on for celebratory display. I’m imagining that will be more appealing to the younger kids, but anyone who wants is welcome to put up their own. We’ve often done this for summer reading programs over the years, and I love seeing all the names fill in. So I can’t wait to see these special stars start to go up. I recently put out the word in our back-to-school educator newsletter, and we’ve gotten a great response. Right now we have over 20 schools signed up and counting, and it’s spurring some really neat ideas. One librarian is already going one step further, planning to reward her star readers with a field trip at the end of the semester to use their well-earned discount cards. I thought that was a really fun idea. You know, as a side note, we’ve actually been seeing a lot of success with our field trip program in recent years. From preschools to summer camps to class trips to larger groups, a number of schools bring their kids to tour the section, get some book recommendations, hear a little bit about the book industry, and browse before heading back to class. We have one librarian who brings in the kids who successfully read all the titles on the Bluebonnet Reading List for a pizza party every year, which is always a blast. But whatever criteria schools use to give them out, we’re just excited to meet some awesome readers. Maybe we know them already, but maybe we don’t. Here’s hoping this is the start of some beautiful literary friendships. Bring on the stars! This entry was posted in Uncategorized on September 14, 2018 by Meghan Dietsche Goel. Megan, you’re brilliant! What a simple but effective way to get those kids in our store! I am going to steal this idea tout suite. Thank you.